Bats and Spiders seem to be the only thing people want to leave their living room for this time of year. Not teddy bears. With this in mind it seems a little risky for Family Guy creator Seth McFarlane to put all his creative eggs in a basket held by a computer generated, beer drinking, bong smoking bed toy called Ted. MacFarlane has reached the international spotlight through his much loved and equally hated animated show The Family Guy. Some call it a rehash of The Simpsons, with only a talking dog and baby who's lifestyle choices remain "questionable" added for good measure. Others will call his humor spontaneous, hilarious and highly quotable. The two animated shows are often compared due to the story revolving around a typical nuclear American family and the ridiculous situations they find themselves in. Placing the normal and the absurd together is the same format that drives Ted and at times it actually works. John Bennet, played with well worn earnest by Mark Wahlberg, has his dream come true when his Teddy Bear “Ted” comes to life when he is just a young child. The boy and the bear form a special bond and Ted becomes an overnight sensation only to be forgotten just as quickly by the fickle American press. Flash forward to John’s adult years and he lives with doting girlfriend Lori Collins (Milla Kunis) and his buddy Ted in an inner city apartment, all the while working as a car salesman. Fearing John will never grow up and become a man, Lori wants Ted to move out and start a life of his own: a life that doesn’t consist of watching television, sinking beers and abusing marijuana on regular basis with her beloved boyfriend. So Ted moves out, gets a job at a supermarket and begins to experience life in the real world. The boys “relationship" then moves to the next level of sincerity, stupidity and responsibility. Writer/Director Macfarlane explains Ted’s introduction into the world briefly and very early on in the film. This gives more time for the jokes to start rolling in and is a smart move not try and explain such a preposterous idea to the viewers. The comedy in the script rarely deviates from the sight and gross-out gags that MacFarlane is known for already. For The Family Guy critics out there, this is not the film to convert you. The jokes are crude, silly and at times quite adolescent. This is not to say that Ted is without heart and at times can raise a good laugh due to Wahlberg’s honest delivery. The supporting cast is also entertaining and there are some funny cameos throughout. Giovanni Ribisi puts on his best creep face and Patrick Warburton comes close to stealing the show with just a few small scenes. The films biggest downfall is MacFarlane using his own voice for Ted’s character. His voice is instantly recognizable as Peter Griffin from The Family Guy and this completely distracts the viewers from forming a fresh opinion on a new character. It is an egotistical move from the director, detracting from the faultless CG work that is used to create the surprisingly loveable character of Ted the talking teddy bear. The film’s running time also runs just over what is needed and one ridiculous fight scene never should have made the final edit. Ted has a lot of heart under its silly exterior and this will confuse some viewers and fans of its creator’s usual work. Others will enjoy what is essentially a very off kilter buddy movie. This movie won’t change your opinion on MacFarlane but there is fun to be had here. 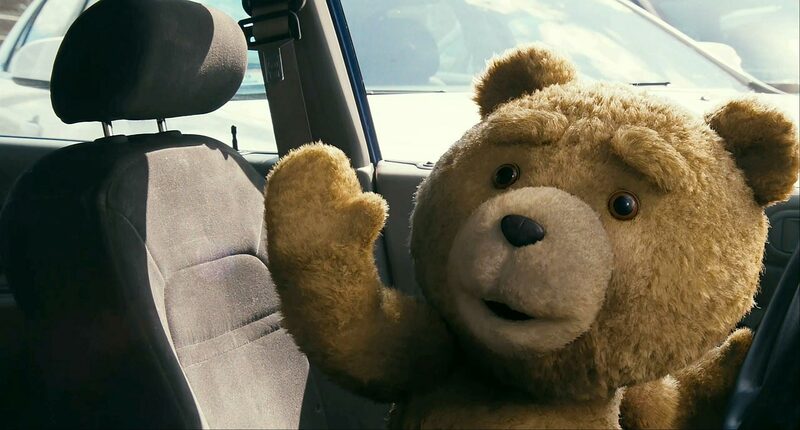 With movie prices on the rise and so much holiday competition, Ted does not need to be viewed at the cinema. In fact, it is probably best enjoyed with some mates or a loved one at home with some beer and popcorn. Or whatever else takes your fancy.